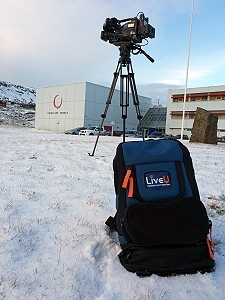 LiveU cellular uplink transmission in Iceland, Greenland and the Faroes. Hackensack, NJ, February 2016: LiveU has announced that RUV, KFV and KNR – the public broadcasters of Iceland, The Faroe Islands and Greenland, respectively – have all turned to LiveU in order to significantly increase their ability to provide live content to their viewers. The KFV and KNR deals have been overseen by LiveU’s partner in the region, Avit Systems. KFV has never had a satellite truck so previous live transmissions had to use old analogue point-to-point equipment or expensive phone lines.